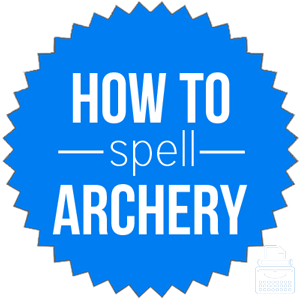 Spelling of Archery: Archery is spelled a-r-c-h-e-r-y. Definition of Archery: Archery is a sport involving shooting a target with a bow and arrow. Much less commonly, it may also refer to the equipment of an archer as well as a group of archers. Pronunciation of Archery: Archery is pronounced arch-er-ee. What does archery mean? Archery is the art, practice, or skill of shooting a bow and arrow, typically at some sort of target. Archery is a sport in the summer Olympics. Archery is a noun and can, therefore, function as the subject or object of a sentence. A person who practices the sport of archery is called an archer, which is formed by removing the “-y” from archery. Archer is also a noun. The best archer in the world is a South Korean man. He was compelled to prove his skills as an archer by shooting an apple off the head of a willing volunteer. As a competitive sport, archery was first introduced to the Olympics in 1900. After the 1920 Games, there was a 52-year hiatus from the Olympic Programme. Archery returned to the Games in in 1972 and has been an Olympic sport ever since. The astrological sign Sagittarius is also known as the Archer and is represented by a symbol of a bow and arrow. This word was first used in the 15th century, according to Merriam-Webster’s. Archery is from the Old French word archerie which comes from the word archier, meaning archer. Ultimately, the word originates from the Latin word arcus, meaning bow or arch. Since archery refers to a specific sport, there are no words with the same meaning. However, there is at least one synonym for the word archer. Archery is a noun that refers to the practice of shooting at a target with a bow and arrow. An individual who regularly practices this sport is called an archer.